Some of the very best picture books are wordless. The way a skilled illustrator can tell a story with pictures alone is awe-inspiring! I find wordless books to be especially helpful for pre-readers and kids who are learning to read, but haven’t become fluent yet. They learn to tell or “see” a story through its images, which is a powerful pre-reading skill. 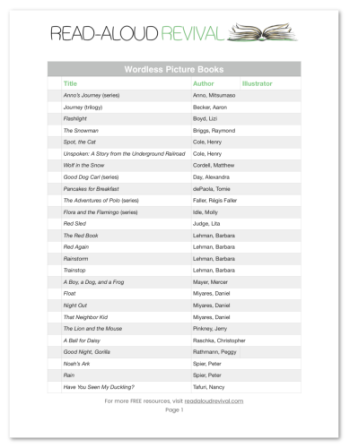 If your kids are participating in the 31-Day Read-Aloud Challenge, find some of these wordless books and add them to your stack! You may be surprised at how much fun your kids of all ages have with these wordless books, and how much your pre-reading child’s confidence grows as he or she reads them.